'I should like you to fish for me at the Loch of the Green Corrie,’ MacCaig commanded months before his death. ‘Go to Lochinver and ask for a man named Norman MacAskill - if he likes you he may tell you where it is. If you catch a fish, I shall be delighted. If you fail, then looking down from a place in which I do not believe, I shall be most amused.’ The quest sounds simple and irresistible, but the loch is as demanding as it is beautiful. In the course of days of outdoor living, meetings, and fishing with friends in the remote hill lochs of far North-West Scotland, the search broadens. The waters of the Green Corrie finally reflect personal memoir, joy and loss, poetry, geology, land ownership in the Highlands, the ambiguous roles of whisky, love and friendship. 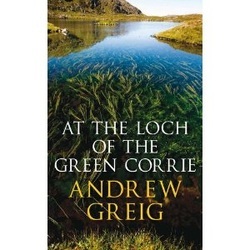 At the Loch of the Green Corrie is a richly atmospheric narrative, a celebration of losing and recovering oneself in a unique landscape, the consideration of a particular culture, and a homage to a remarkable poet and his world. It is published by Quercus. To buy this book, or to find out more about the publisher, please click HERE. For a review of the book, click HERE.